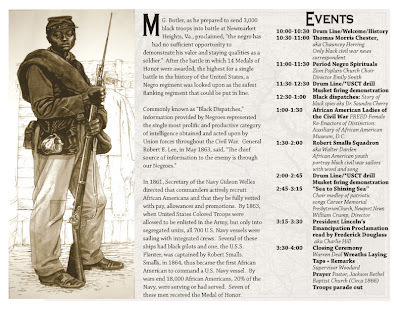 Being held at the Gloucester County Historic Courthouse Circle September 24th, 2011 from 10:00 AM until 4:00 PM will be a Commemoration of the African American's Fight For Their Own Freedom event. Above is a list of the days events. From personal experience, Gloucester does an amazing job building and hosting events throughout the county. The issues are getting the word out to the public about these events. Well there are a number of us now working on fixing that issue. The major problem is budget constraints within the county. We promote Gloucester County and county events for free. This particular event will probably be a one time shot being the 150th anniversary of the Civil War here in the United States. So everyone everywhere has been producing unique one of a kind events throughout the nation because of this fact. This is a great time to see a different side of history not often portrayed in other Civil War re enactments. The event itself is historical and deserve great support. So send this information on to as many people as possible and help spread the word.